Profusely illustrated, Exotic Gems II helps you see and understand gemstones. Detailed information about the pricing factors used for colored gemstones and gemstone appraisal. 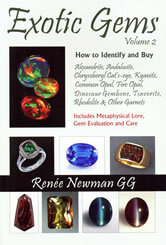 Then detailed descriptions for alexandrite, andalusite, chrysoberyl cat's eye, kyanite, common opal, fire opal, dinosaur gembone, tsavorite, rhodolite and other garnets. You will know a lot about these gems when you read Exotic Gems II! This book is a 6" x 9" paperback with 154 pages. Where are Gembone and Coprolite Found?